A federal researcher says farm runoff from the Mississippi River is a factor in damaging algae blooms in the Gulf of Mexico. 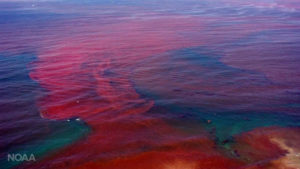 This year Florida saw one of its worst algae blooms on record, called a red tide. The massive event killed dolphins, sea turtles and thousands of fish, sending their carcasses onshore. Oceanographer Rick Stumpf, with the National Oceanic and Atmospheric Administration, says Midwestern farm runoff contributes to red tides, flowing into the Mississippi and on to the Gulf. “Somewhat higher levels of nitrogen are found in the lower salinity water which follows with the Mississippi,” Stumpf says. Added nitrogen in the Mississippi River can spark the blooms, but Stumpf says there are many other factors at play. “So that is another potential source,” he says. “It’s not the only source of nitrogen, I should emphasize that, but it is one.” The microscopic organisms thrive on nitrogen and Stumpf says nutrient runoff from farm fields in the Midwest is certainly contributing to the deadly blooms. “From one year to another, it might be a little more of factor if there’s a little stronger eastward transport,” he says. “So a huge part of this is going to be, what are the prevailing winds doing.” Stumpf says other major factors in the algae blooms include runoff from Florida farms and wastewater facilities, as well as some naturally-occurring sources.